I never called it “anxiety” until it was gone. In fact, I justified it: I had three small kids, one with autism, and I was a WAHM. Obviously, I was stressed out! People around me justified it also. “I don’t know how you do it.” Not with grace, unbeknownst to them. Certainly not with patience, or faith that everything was going to be okay. The only person who seemed to know I had a problem was my husband, and I could NOT tolerate him pointing it out. He didn’t call it anxiety either, and I resisted fiercely his attempts to loose its grip on me. I clung to it. I’m allowed this, I thought. Or, I have this under control. Then I thought I was pregnant. Ha. You have to understand, when we first got married, we wanted five kids. Now we have three. So pregnant is good, right? Not when anxiety has stealthily gained control of every aspect of your life. So when the test said “Pregnant” I was NOT thrilled with the grain of life that God had (supposedly) gifted me with. Way to reveal my heart, God. Soon after, my temper with my four year-old was so short, my husband actually took her to work with him so I could spend some time alone in prayer. Yikes. During this time when my anxiety had escalated so that God could reveal its nature and ultimately break its power over me, I actually thought I was losing my mind. Seriously, I called my mom and asked if she thought I might have some kind of mental illness (she did not support THAT hypothesis). At this point I had actually started to increase my prayer life a little bit, the absence of which I easily blamed on my children. So during my time with God, I realized I needed to repent. The stress and feeling of being overwhelmed that had consumed my life was a slap in the face of God’s sovereignty. If I truly trusted God that He would take everything, why was my life characterized by fear that I wouldn’t be able to get everything done? I don’t mean a little worry or nagging in the back of my mind. I mean a constant berating, before every activity, during every time my children made things take longer by simply being children: throwing everything upstairs downstairs, escaping poopy diapers without my help, not getting dressed in a timely fashion before church. All these things sent me into panic mode. And if two of my kids were screaming or needing me simultaneously, forget it. Mama’s losing her mind. Romans says that everything that is not of faith is sin. I needed to accept that my “panic mode” was not cute, was not normal behavior, and did not, in the slightest, bring glory to God. When I realized this, I confessed my sin to God. Coincidentally, at this time, the small groups at our church were doing a study on the Holy Spirit. This of course, bringing to mind the certain fruits of the Spirit that were absent in my life. In particular, my children and husband were taking the brunt of this lack. So no lie, I Googled “how do I get the fruit of the Spirit in my life.” That goes to show you what my Bible study skills had devolved to at this point. Not surprisingly, they all pointed out that the way to get the fruit of the Spirit was to cultivate relationship with God through a regular devotional time. I was already praying and reading my Bible, but literally either in between kid tantrums or after they had gone to sleep and I was completely exhausted. For the first time in years, maybe ever (?) I initiated a routine of having my time with the Lord in the morning before the kids woke up (well, technically after I had dropped Jac off at the bus, but before Zac’s morning chatter turned into screams demanding crib extrication). It was amazing. Just me, God and coffee. What I felt from the Lord at this point was that I was to pause at every moment where I felt the temptation to freak out, to complain, to yell, whatever, and to ask Him for help to handle it well. The first few days were okay; I did much better than I had been doing. I actually was able to choose the right attitude. The emotions that were driving me to anxiety were basically there, but I was somewhat able to control them. Then another thing that helped was I started to journal, just short entries that helped me see what worked and what didn’t. This is where God gets the glory. After a few days of struggling to not let the anxiety take control, GOD TOOK IT FROM ME. Entirely. For every situation, there would have been the expected clutch of the stomach, the spinning of the mind, the loss of rationality and entrance of complaining and stressing out. There was nothing but peace. There IS nothing but peace. This has transformed my life. I had no idea how miserable I was, barely surviving from day to day, being crushed emotionally and exhausted physically. Now I have joy. Now I have peace. I still occasionally experience the stressed-out feeling, especially when I’m getting the kids ready to go somewhere, but anxiety is a conspicuously missing element of my life. I hear from so many people who struggle with anxiety and depression who just own it. They like to explain what it like so we can be empathetic and not judge them. I remember what that felt like. Just understand me. But those are chains we don’t have to wear. 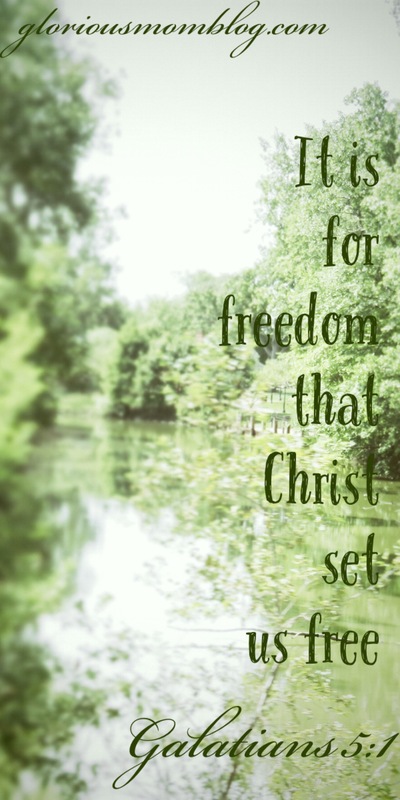 “It is for freedom that Christ has set us free.” If you repent of your fear and lack of trust in God, if you seek His face earnestly for freedom, He will break the chains. You can be free from anxiety. I was so there! I really loved this blog! Keep it coming! Thanks, Sally! I wish you had a blog!! Thanks for this Susan….wow….soooo good. this is exactly where I am now. The anxiety part. I wish we lived closer:-) Thanks for your blog! I have struggled with this since my children were born. My Bible study and I are doing Anchored by Lauren Hlushak- about breaking the chains of anxiety. I have been trying to study what the Lord says about anxiety on my own, but you’ve encouraged me to move my devotional time to the morning. Thank you so much for this post! I enjoyed this post! I too struggled through a pregnancy during a highly anxious/ panicky period. Thank you for writing this! I have struggled with anxiety my whole life. Several months ago I thought I had it mastered, only for it to come back again even worse. What I’ve realized is that it IS a stronghold that only the Lord can break. Another blogger described it as “a terrorist attack on your mind from the enemy”. Anxiety is completely irrational in that it makes you believe that everything is all up to you, and something terrible will happen if there’s a mess somewhere or things out of place. Basically it’s a gigantic lie from the devil, and if we’re not grounded in the truth of God’s Word, we fall prey to believing it. Thanks for the reminder to spend time alone with God before the kids get up. I know that when I slack off in doing this, I am more prone to the enemy’s attacks! Thanks, Marisa! I love your blog, so I’m glad one of my posts blessed you.